sailboat. : My New Desk: A Tour! Until about a month ago having my own desk wasn't even on my radar. A change came about when I was offered a table to review/mention and suddenly I was so excited about having a proper workspace and pictures of beautifully styled desks were all I was searching for on pinterest. Last week the project fell through with some things happening that meant I wouldn't be able to recommend the company, but I certainly wasn't about to give up on my desk dream in a hurry. We braved Ikea on a Saturday, stopped off at the restaurant for some fuel, dodged our way though screaming children, and left with a beautiful new table. I chose the Linnmon/Adils table in high gloss white and it was worth every extra penny for the gloss finish as opposed to the regular white, it's so wonderful! During almost every Ikea trip I've ever made I've found myself lusting over the Forsa lamp, but I've never had anywhere to put one until now. Needless to say I didn't waste any time adding one to my trolley as we walked through the lighting section. Lastly I opted for the Adde chair in white, which feels so much more sturdy than I was expecting from something that was only £10! 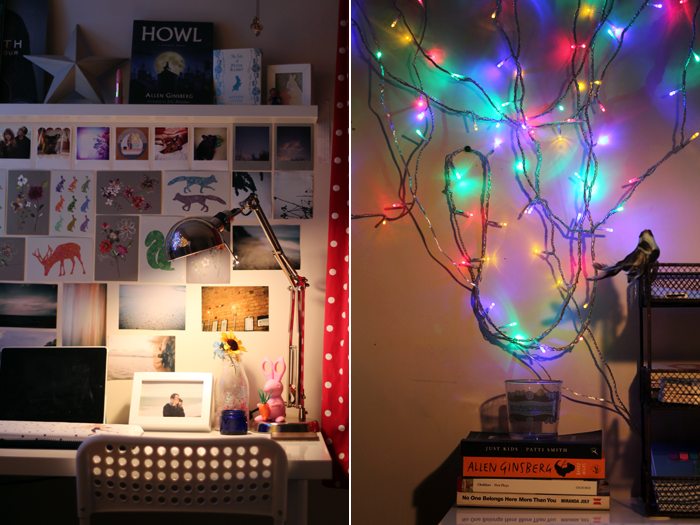 For me fairy lights are a must and I put them up pretty haphazardly but I love them. I rescued the Elvis russian doll from my mum's shed - she has quite the russian doll collection but after a recent declutter poor Elvis didn't quite make the cut. 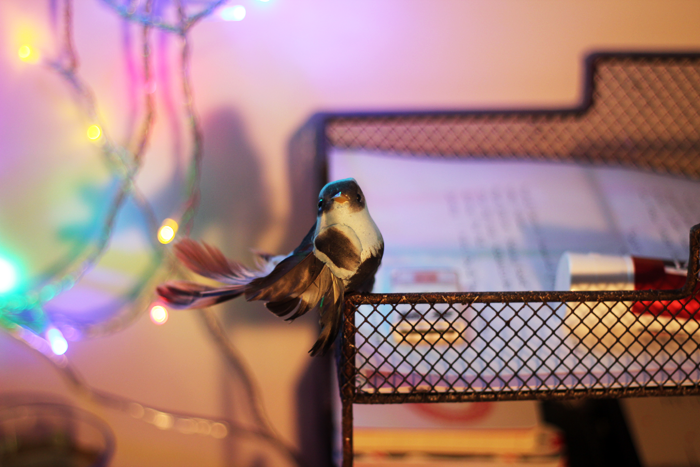 I think he looks quite handsome on my desk though, so I'm happy to have him singing away over there in the corner. I like to use empty Neal's Yard jars as tea light holders because they give off the prettiest blue glow that's just lovely. My absolute favourite additions though are all from Rockett St George, a fabulous homeware & gift emporium that carries the most beautiful and unique pieces. How wonderful is it to come across a business who clearly love what they do so much, and pay such close attention to the little things? Their customer service is also impeccable and I know that I'll be making many more orders in the future. The piece that prompted my order initially is this charming vintage style desk tidy. It was so much more difficult than I expected to find a reasonably priced vintage style paper sorter that wasn't shabby chic, so I'm thrilled that I found this one! The bottom tier has my University workbooks, the middle tier is for notebooks and to-do lists & the top tier is for any blog related things (& The Elder Wand, of course)! The little blue & grey bird that I've clipped on was an impulse purchase, but at only £2.50 I don't feel guilty about it at all and I think he's incredibly sweet. He looks like a Bertie, so that's what I'm going to call him! 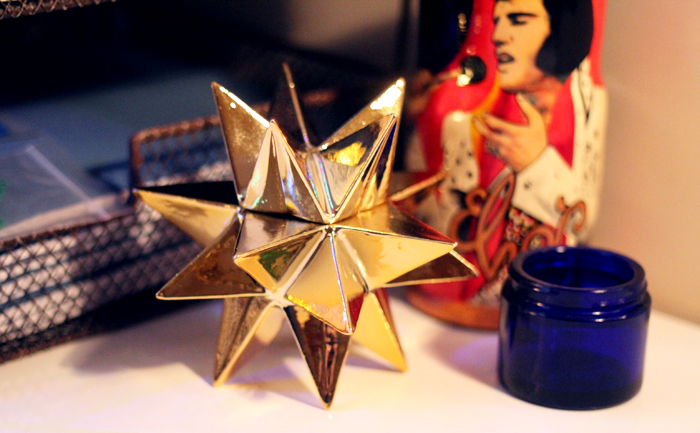 Finally is my gold ceramic star candle holder, which I'm just using as a beautiful decoration minus a candle. Honestly? I totally bought this because it looked like a little curiosity that Professor Dumbledore might have had in his office. Yep, that's the actual reason and I don't regret it at all! Along with a lot of photographs & prints I also have a Ribba picture ledge on the wall. At the moment it's holding some records, a star decoration, a lipstick shaped pen from the latest Birchbox*, a copy of Howl A Graphic Novel, an anniversary edition of The Tale of Peter Rabbit, a worry doll & a sweet card from Rachel that I had to frame because it's so lovely! + An Aromatherapy Associates candle box* I'm using as a pen pot. + Glass bottle from Ikea that I've filled with glitter & an artificial flower. Do you have a desk that you work from? I'd love to see pictures of your space if you have any! I love the coloured lights on the wall and all kinds of YES to Dumbledore's star!!!! Such a great space to work in! Wow, I love your desk! And I hate mine lol. I love it! I'm on the hunt for a new desk right now but want a big and slim corner one, so my options are limited. It's so nice to have a little work space tucked away. I love this! It's such a beautiful space - much better than my desk which is covered in old papers and dust...! It looks lovely Jennie, so cosy! 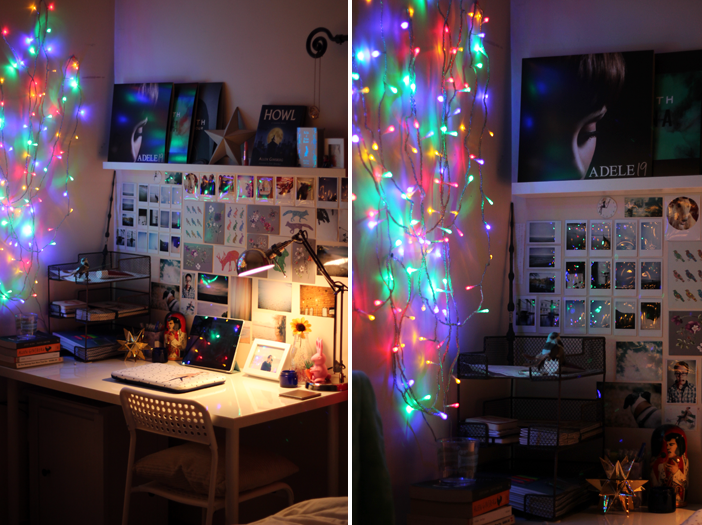 I love the fairy lights. They add a nice touch to your workspace! This has given me some inspiration for when I get my own desk. I absolutely love your new desk area, it's such a magical little space! Must be a joy to work at. I spotted your candle holder in a previous post, LOVE that. Such a gorgeous desk space! I always love looking at other people's desks as everyone is so unique. Mine looks awful compared to this though :( I have to store all my uni folders on it so it's very crammed and messy! One day it shall be this lovely! Just omg I am in awe of how amazing your desk looks. I seriously cannot deal. Mine looks beautiful for about a day and then work and chemical structures and lab notes fill it with empty mugs and it just looks like a mess again. This has definitely inspired me to make my desk look pretty again - mine is horrific in comparison! It's a beautiful desk! Are those Instax pictures sitting in the corner? I have something similar too, but my pictures are nowhere as colorful as yours! I love, love, LOVE your desk area! It feels so personal and inspiring, and completely motivates me to do work. The desk area I have now still has post-its from previous work on the back wall. The trouble I have is that I dual monitor. I'm definitely going to have to revamp my desk area! Ooh I love it, so cosy but neat! My desk is a mess, haha. Love it! 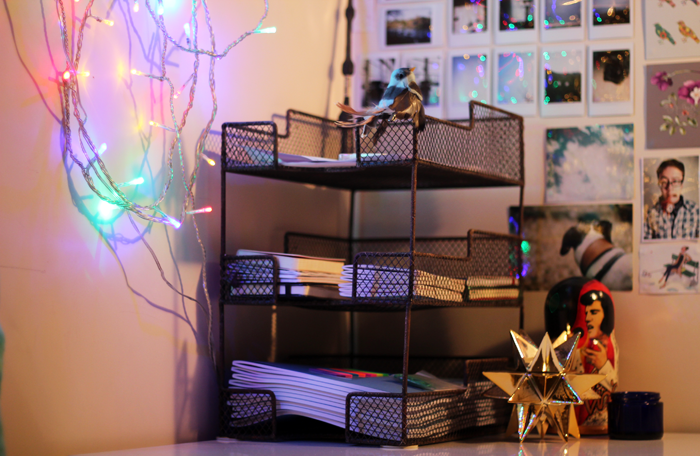 It looks so cosy and organised :) My desk is currently unbearable, oops! It looks amazing! I have the same desk at my parents home and I love it - you're right, the gloss finish is amazing, it's a great photo background too. It's so nice to have a cozy place to work! This all looks lovely, I'm just amazed that someone invented Elvis Russian dolls!! I LOVE your new desk! I do not really have a working desk but I wish to have one when the boyfriend and I get a new home together. When that time comes I will be thinking of your desk as inspiration! What a lovely working space. 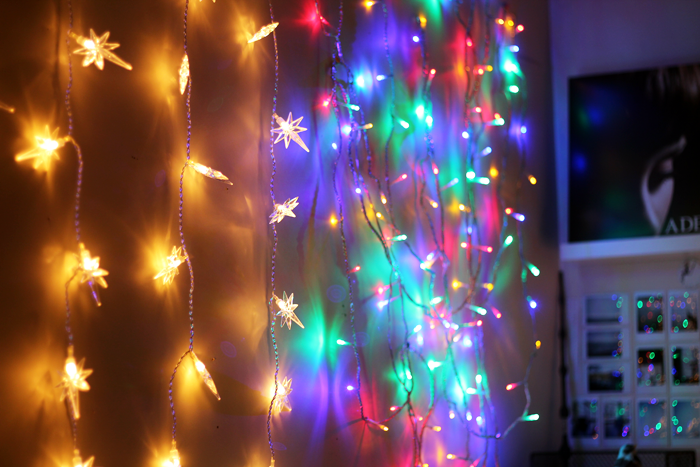 Fairy lights make everything more magical. Such a gorgeous space! I love the collection of photos/postcards on the wall, they're perfect for daydreaming looking at them. I wish I had room for a space like this, unfortunately I don't at the moment - but this looks perfect! I'm so in love with this! 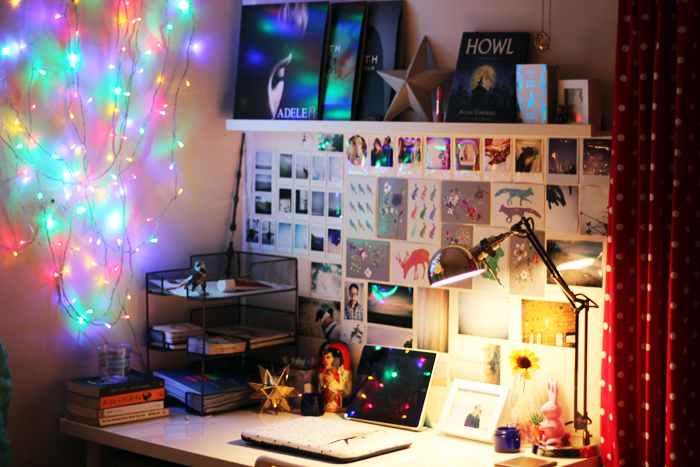 I may actually do uni work if my desk looked like this. 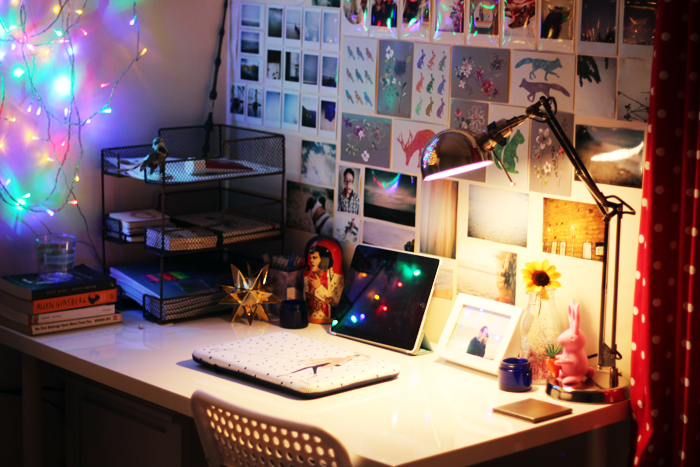 love all the lights, it looks like a really relaxing work station! Such a great workspace! Since I'm in school and my television takes up half of my desk space, I hope to make a workspace as cool as yours in the future. This is such a gorgeous desk space! I love of your little trinkets - choosing something because it looks like something Dumbledore would own is the BEST reason I have heard for shopping before, and Bertie is such a cutie! I've been looking for a desk chair for weeks now and I'm annoyed I didn't notice the Adde chair in Ikea - it's so simple and perfect.